About Stephen P. Message Stephen P.
Wonderful tour and service. Touring with Stephen was like having a knowledgeable close friend show you around. Our family of three (17-year-old daughter) thoroughly enjoyed every aspect of the tour, and Stephen's recommendations for further sites to see, restaurants, etc. were awesome. Thanks, Stephen!!! We had a fabulous tour of Malta with Stephen. He was extremely professional and knowledgeable. He Is very funny and enthusiastic. We enjoyed our afternoon with him and we recommend him highly. Thank you Stephen! Outstanding. Fantastic. Wonderful. Far exceeds expectations. I could go on and on describing the amazing tour our group had thanks to Stephen. He is extremely knowledgeable, fun, thoughtful, and engaging. I would jump at the opportunity to tour with Stephen again. Stephen is an outstanding guide who far exceeded our expectations. His in-depth knowledge of Maltese culture, history, and lands left our group engaged, intrigued, and entertained. His cheerful optimism, even in the face of a stormy day, made us know instantly that we were in good hands. Stephen is a consummate professional, and he is friendly, thoughtful, and flexible. I recommend Stephen without reserve. He's the best! Stephen was amazing. A handsome, professional man with a wry sense of humour. He bought Malta alive using stories, anecdotes and little touches that surprised us and delight us. Highly recommended. Stephen is very professional and very knowledgeable. 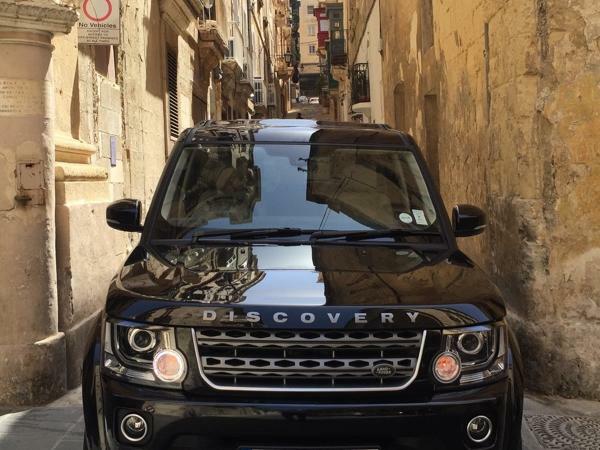 He drove us all over Malta, through all the narrow roads to give us the true experience of Valletta. When we met we asked him to include a beach stop for a quick swim. He suggested the Blue Lagoon which was awesome! What beautiful crystal blue waters. There we were able to do a boat tour of the area and finished with a quick swim in the harbor. And to top it off, his Land Rover vehicle was very comfortable. A really great tour, Stephen listened to our interests and delivered even more. Packed in a lot in the 4 hour tour and feel we have learnt much about the history of Malta, very knowledgable and most interesting. Excellent and extremely knowledgeable. Tour was well thought out. Couldn't have been better. Very good about giving you as much time as you need. Never rushed. Overall fantastic. Stephen is fantastic. Our day with him was second to none. We visited the Three Cities, Valletta, the fishing village of Marsaxlokk where we had coffee, also the Blue Grotto that is a must see, Mdina which is also very special. Stephen's knowledge of the History of all these places was terrific and he made the day so much more enjoyable because of his knowledge and personality. First class day in every way. Our Malta tour with Stephen was one of the best of our entire vacation! From the Blue Grotto and seeing the boats in Marsaxlokk, to a walking tour of Mdina and Valletta, Stephen made sure we made the most with our limited time. He was very knowledgeable and entertaining and kept our group engaged throughout the entire tour. He catered the tour so we could really experience the island and took great pictures for us too. If you're traveling to Malta, Stephen is the guide to have! We have just completed a whole day private tour of the highlights of Malta and had one of the best days of our entire europe vacation. Our guide, Stephen P, thoroughly keep us engaged and entertained from the moment he picked us up, to the time he dropped us off, 8 hours later. His local knowledge and historical details provided us with everything we needed to get a real insight to the true malta, in a relaxed and friendly way. We cannot recommend him highly enough as a great way to tour Malta. We had an absolutely amazing day's tour of Malta with Stephen; it was the highlight of our holiday. Stephen was so professional - he made sure everything was perfect for us - but also friendly, informative and with a great sense of humour. He really made sure our party was taken care of, including my 80 year old father, and our itinerary covered everything we wanted to see (and more) at a pace that was comfortable for us. Brilliant. Best 8 hours. Fun incredibly knowledgeable funny caring. Want to take him home made Malta worth visiting worth every euro. It was a pleasure to have Stephen Place as my guide of Malta for the day. Even though it was pouring rain in the am, and I had every expectation of being cancelled, he came anyway and the weather, fortunately, cleared up for the tour! Stephen was very knowledgeable of the island and it's history. I only wish I had a full day to see more. If I ever get to return, I will be booking Stephen again. Steve is a great guide, frank and friendly. He really wants to show Malta at its best and build his route according the wishes of the tourist. Easy going and interesting, 4 hours flew like 30 minutes. Flora and her driver provided a wonderful tour despite horrific weather. Flora was very knowledgeable and responsive to our desires. Alfred was a superstar. He showed us an amazing day in Malta. He was friendly, knowledgeable and took excellent care of us. I will hire Alfred next time I am in Malta and can't recommend him enough to others!!! Stephen provided a very knowledgeable, informed and enjoyable highlight tour of the island. He was both friendly and professional and we enjoyed traveling with him. The tour was well designed to provide a broad overview of the island and its history in a single day and it achieved that objective. First class tour. Knowledgeable. Made our tour seamless and fun. Above and beyond what was expected. Highly recommend. This tour conducted by Alfred exceeded our expectations. I had requested a specific type of tour and that is exactly what I got and more. Alfred was knowledgeable, funny & an all around terrific tour guide. I would highly recommend Tour By Locals. Stephen is a terrific guide and he gave us a wonderful introduction to Malta. He is knowledgeable and fun; this tour is highly recommended. Stephen is a professional! He was waiting for us at the pier and his vehicle was clean and modern. He had a clear itinerary in mind, yet he also listened to our preferences and priorities. Although he is not an historian, he knew the subject of Malta and answered all of our questions. He was a gracious host and we recommend him highly!! Stephen was excellent. He was very knowledgeable, considerate of our needs and he had a great itinerary set up for the time we had available. The Valletta/Malta experience was very memorable - one not to be missed if you haven't been there. We would highly recommend him and his services. Excellent guide and tour. Stephen was fantastic ! Stephen was a joy! He was very accommodating to our request to spend more time in some places and less in others. Before we even met, he phoned to suggest switching the order of our two tour days with him, so that our time on Gozo was spent in better weather. Stephen was very knowledgeable about the history and culture of the area, and very entertaining too! Thank you Stephen for a lovely day on Gozo! Our day in Valletta was much changed from the tour outlined but that was to accommodate our requests, as we had booked other excursions. The best was that as we got to know Stephen and his assistant, Ingrid, they made excellent suggestions for what to do For example, once they heard that we would be visiting a few archeological sites in the next two days, they suggested a visit to the archeological museum. Excellent recos for food, wine, and other activities -- and much fun and laughter. THANK YOU!!! Stephen was a great guide. He was very knowledgeable, interesting, and offered us a very interesting itinerary. We especially appreciated his bringing us local food and drink - twice! Highly recommended!!! Stephen was engaging and entertaining - we learned many interesting things about Malta and he engaged our kids (age 9 and 12) as well as the adults. He was flexible with us which we appreciated, giving us options but recommending the best parts not to be missed. We recommend Stephen highly - a great guide!